We are glad to announce the latest updates to the Microsoft Bot Framework that will enable intelligent developers to use more tools for creating bots. The Microsoft Bot Framework offers what you need to develop smart bots. Such a bot framework can communicate with users via text/SMS, Skype, Office 365 and other services. Currently, the bot framework supports bing, Cortana, facebook, email, telegram, etc. The Microsoft bot framework updates provide complete resources to create intelligent bots. These smart chatbots can communicate wheresoever your user is addressing. The framework is a powerful tool for developers to build active chatbots quickly. We are happy to share the new launch of the bot framework SDK version 4.3. Take advantage of this excellent opportunity to get additional services for interaction from Microsoft. Microsoft bot framework connects you with the user wherever your user is conversing. How To Construct a Microsoft Bot? For What Purpose Do You Require a Chatbot? The Bot System separates the bot for certain administrations. This segment enables the designer to concentrate on bot usefulness while the system handles correspondence with the client and discussion history stockpiling. If you have your own business and want to develop intelligent bots, get a complete guide over the framework overview from here. With the use of a Microsoft framework, an organization can build up intelligent agents called Bots. So, we can say bots are like conversation agents. Today, bots are quickly converting into an integral part of our digital experience. Bots allow users were conversing with intelligent bot solutions as they talk to another person. The interaction can take place using services like text/SMS, Office365 mail to skype and slack. The bot connectors allow you to add your bot with text/SMS, office 365 mail, skype, and slack service. A user needs to register their bot first merely. Then configure process comes for the user’s desired channel for publishing in the Chatbot directory. An open source SDK is known by Bot Builder SDK to fulfill a user needs to be required to construct great dialogs based on C# or Node.js. 2. How To Construct a Microsoft Bot? Microsoft Bot Framework is an SDK that allows a developer to build conversational chatbots with ease. Using the Microsoft framework, a user can create their bots with SDK’s. The SDK is available in C# and Node.JS in the Microsoft Bot Framework. The conversational process in the Microsoft bot framework works like a simple conversation between two users. Each series of conversation get pronounced as a Dialog. On the other hand, the input gives by a user is called Utterance. The user can enter their information via Skype, Facebook, Telegram and Web Chat channels. Now after getting input by the user, we need to parse the utterance for seeking what the user means by saying words. So, we should take the help of Machine Learning Web Service. LUIS (Language Understanding Intelligent Service) can get used as a Machine Learning Web Service. After that, the LUIS delivers the utterance provided by the User on a specific channel. LUIS will parse the user utterance by taking help of complex cognitive machine learning algorithms. 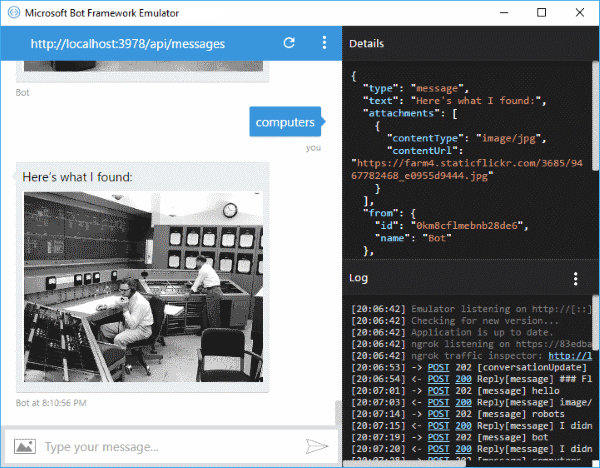 Microsoft Bot Builder is a robust tool SDK framework for constructing intelligent bots. The builder provides a simple way to write bots. Microsoft created its bot framework almost the same time as Facebook. The SDK can get visualized as two components which are independent of each other. The component integration of Microsoft Bot Framework is impressive because it can get integrated with Slack, Facebook, Messanger, Telegram and Web Chat. The framework offers the most delicate structure to develop and deploy good quality of chatbots. A person can use MS Bot Builder to create bots for connecting to MS Bot Framework. Best platform for agnostic products. Able to deliver, get messages from conversation system. Built-in dialogs for strings, number, and enumerations. Bot connector facilitates interaction between bot and user by parsing messages from bot to channel and channel to bot. The bot builder gives authority to store and retrieve state data linked with that user. The Bot Framework Connector service can only invite your bot’s endpoint. Microsoft Bot Framework provides bots wherever your users are communicating. Some challenges are faced while building a chatbot, then you can hire a chatbot developer to make efficient and robust chatbot. Microsoft Bot Framework is an open source framework whereby a user can start the process of building new products. Microsoft Bot Structure is itself a platform to connect your bot with another platform. Somehow, if your bot heavily relies on NLP, LUIS NLP service can easily integrate your bot with Microsoft framework. Microsoft bot framework supports languages like .NET and C# and also develops these in default choice of enterprises. So, register your bot first with Microsoft Framework. After that, automatically creation of connections will happen for your website. The write once and run anywhere is the smartest way if you are trying to estimate a homogenous experience across a broad range of touch points. However, there is a lack of custom tailor content on the platform through which it will get consumed. But Microsoft framework is a platform itself. Therefore, developing intelligent bots may be fun and beautiful approach with the right structure. If you use a bot framework platform to build a bot, you may know how easy it is. You will be surprised to see how easily you can connect your bot to new channels with Microsoft. Apart from that, you may experience a variety of practices offered by these channels for the users. Channel inspector is an interactive web tool that makes easy to understand the style of a user. Manually instruct the direct line client in Europe and Asia to our datacenters for lower latency. An online business needs some chat support for solving the issues related to their business. Make this possible only through several different chat applications. The consumer can directly chat with the business agent. A chatbot is enough to use for understanding the question asked by the user. Answering the frequently asked questions is the use of Chatbot. We can also determine the business solutions with enough use of Chatbots. If your business is operating or handling several tasks, then an alternative intelligent chatbot may give you great help. Not only this, but Microsoft Bot Framework also provides the technology to develop chatbots to chat with more than a billion users. FB messenger is among them that enables Bots to address with various FB users. Along with this, e-mail, SMS, Skype, and slack channels can also be used to operate a chat. We are delighted to acquaint you regarding the latest version (4.1) of chatbot framework SDK. This SDK version appears with the customary chatbot framework emulator availability. It also supports an open source application for Mac, Windows, and Linux to the bot developers. Developers can get benefits from Bot Framework Web Chat Control for quickly integrating bots into existing websites. Web Chat control provides faster access to the bot developers. Search number of frameworks to develop a bot. We have also provided the complete guide over bot frameworks to be read by every user. Around 1 billion Facebook users are improving every day. We may let you tell that over 20 million local business pages get covered through facebook. If you are also developing a bot for your small business, a messenger is the only way to go and chat with the client. For a US consumer, a messenger is perfect to go. It is the most popular chatbot in the market. If you are building a chatbot for an Asian audience, then WeChat is the way to go. Slack is offering for internal messaging within and between teams. It is an ideal tool for businesses because it allows professionals to interact using chat. So, Slacks are focused on business activities. If you are finding a global audience, then telegram is a good way with some additional features. It is a messaging app that mainly focuses on Japan, Taiwan, and Thailand. So, if you are looking in Tokyo, then Line is an excellent choice for you. Build a chatbot for Twitter with brands for customer service. Order pizza via Twitter by building a twitter bot. A user can create an SMS based chatbot with ease by getting any five vanity number. A user needs a name to access chatbot. Microsoft provides a framework to bot developers to build, destroy and publish their bots. More Capable of serving services like translation, cognition, azure, and history. The Cortana integration will provide a Cortana channel. Cortana development experience can get achieved through speech support. It is allowing developers to create and upload a skill to Cortana. Bing Bots are also connected via bing channels and using bo framework. Bot developers will soon get access to publish their bots to bing websites. After that, they will be able to look up in the Bing Bots Rich Answer. Hence, users can chat with the Bot by visiting on bing.com. Developers can occupy a more natural way to compose their cards through adaptive cards which get prepared via composable visual building blocks. These blocks can redesign the host’s UX, theme and modality automatically. New LINE Channel: Connect a bot to LINE to enable your bot in a new channel. The release of 4.3 focused on improving and simplifying al activities. The statement gives a new path to handle all incoming messages. On the other hand, with the help of Azure Bot Service a user can integrate bots for speeding up its development process. 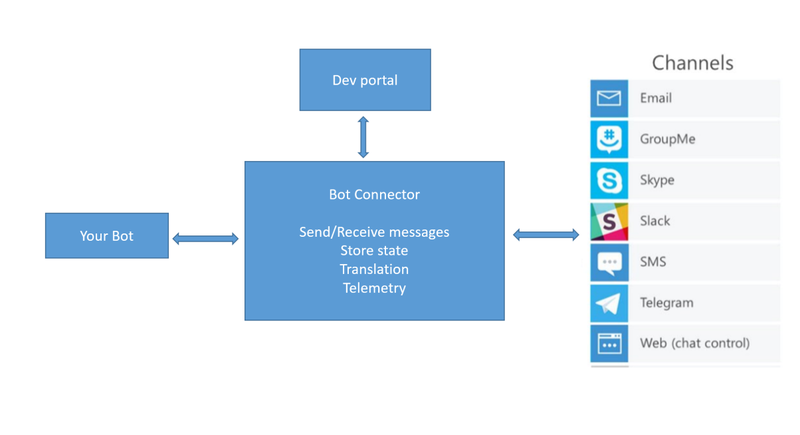 Microsoft Bot Framework Connectors and Bot Builder SDKs purposes built integrated environment for bot development. As of now, three new channels are accessible. It will expand the introduction of your bot to the large Microsoft group of onlookers employing common texting applications. Presently, you can create smart bots by incorporating the Bing channel. It empowers clients to find and visit with the bot specifically in the Bing output. Utilizing versatile cards, you can give your clients a reliable ordeal by giving astonishing conversational UI structure. You can make straightforward yet powerful cards using HTML and CSS. It is to offer a consistent client experience on delivery people crosswise over different gadgets just as modalities. The shopping basket relinquishment rates are expanding over the web and building up a bot. It gets incorporated with installment ask for the Programming interface. It diminishes bothers amid the checkout procedure. Online retailers would now be able to have a chapter empowered bot created to energize in-application buys. It helps in streamlining the checkout procedure for their clients. These language models will improve generally speaking application profitability empowering improved discourse acknowledgment, quality, and execution. To improve the advancement of bots, Microsoft has included 20+ adjustable bundles in LUIS that help in making incredible language models that react to the client demands. It parts up the bot’s business rationale and the bot’s conversational rationale with a rich runtime that oversees discussions successfully. The survey provides discussion level subtleties relating to clients, the channel information, & messages. Azure, Microsoft’s cloud, gives many administrations to make cloud improvement quickly. It doesn’t even need to stress over foundation, for example, equipment. Experts simplify the benefits and challenges of creating a Chatbot appropriating the MS Bot Structure. They additionally stroll you through making a basic bot. They are a piece of cloud unrest which conveyed programming to another dimension. It gives incredible accessibility and adaptability to low improvement exertion and support cost. This article centers around the Bot Structure – Microsoft’s cloud answer for bot improvement. You can give moment backing to your clients, accomplices and new leads. These all are not exclusively to introduce the substance, yet additionally to collaborate with the client. A bot can make utilization of questions and answers learning to get client question and give a fitting response. Issues can be coordinated to address answers utilizing a LUIS intellectual administration. Decreased time can be spent by help work area staff sending common inquiries. Criterion use cases are contact pages, assistant chat, and web stores. By coordinating a bot with outer frameworks, a bot can turn into an elective interface to work with these frameworks. A bot can necessarily make a few inquiries and assemble the appropriate responses given by the client to submit information that typically would be filled in on a structure. A bot can be likewise used to engage and teach its beneficiaries by sending different sorts of substance to the client. It’s a smart thought to use media types like recordings, sound, pictures, and connections to information base articles. Model use cases are exercise mentor, formulas book and item counsel. A Chatbot can be planned to instate discussions at the proper time, telling the client about specific activities or reminding about things he ought to do. Recognize that transferring proactive information isn’t regularly understandable. It relies upon on the carrier communication for communication. 13. For What Purpose Do You Require a Chatbot? When I joined a group amassed to build up a bot, I was confounded – is it remarkably the sort of programming wanted by big business clients? From that point forward, great deals of the work area and on-premise frameworks get moved to the cloud. Web applications turned into a critical piece of this procedure. Azure cloud permits are choosing a suitable app administration plan, contingent upon your demands. For purposes of generating little exchange, the debt is minute or even free. You don’t need to dissipate time along with what will happen if the exchange promptly supplements. Statements promoted on Azure can mount up to trade with greater exchange and balance down when it gets completed. The accessibility of cloud administrations gets contrasted with in-house IT framework. Send an incorporated application from your neighborhood direction line or construct server. Distributed computing makes it simple to interface web application with different structures, sharing the information or occasions among one another. That permits constructing all around incorporated applications with moderately little exertion. An application may get dispossessed to discharge assets for different applications running on the server. That usually happens when the use stays inactive for quite a while. It’s as yet accessible, yet the first run through it’s called after a long dormant period, you may encounter a more extended stacking stage. This detriment is unfortunate particularly for bots, where a fast reaction is a crucial component. Be that as it may, a virus begins is run of the mill for lower application administration designs and can get fixed by redesigning the arrangement. It is a typical web application stores a few information in the database. Typically the database is additionally facilitated in the cloud, which means it’s conceivably defenseless. The way that cloud servers get situated in different nations may turn into an issue for individual clients, contingent upon their security arrangement. The Internet Programming interface Administration gives an endpoint dependable to noting client exercises. The designer must execute this rationale. In any case, the Bot System makes this activity less demanding by presenting the idea of bot exchanges and a lot of interfaces and types. The Bot Web Programming interface is likewise an administration in which reconciliation with outer frameworks and administrations ought to be actualized. The discussion between a bot and a client is the most fundamental element the Bot System gives. For presenting it fruitful and active, a determination event is put beyond to the ChatBot State Management each time the added campaign is dressing recorded. It keeps the unique idea of Bot Web Programming interface and Bot Administration. Bot state can be reserved in memory or put away in persevering stockpiling. On account of the process that a chatbot state kept in a database, is repetitively storable any time. It is conceivable to build up a bot equipped for proceeding with recently introduced discussions. Note: at the outset, Bot System delivered with the default State Administration which gets incorporated with Bot Administration. Nonetheless, it will get disciplined in future discharge. It’s prescribed to use other capacity administrations like Azure Stockpiling or Universe DB for bot state, particularly for creation bots. Bot discussion configuration may appear to be a simple undertaking – you need to give a suitable response to unsurprising inquiries. In any case, things are not as necessary as they may look, particularly for complex ventures. The most intuitive approach to characterize the bot degree is to plan its discussion utilizing exchange situations. Microsoft Bot Structure permits improvement of incredible bots. Notwithstanding, it’s only a lot of apparatuses – we don’t prepare a to-utilize bot directly in the wake of making the venture. Ordinarily, a Chatbot requires growth to produce a few functionalities. It’s great to acknowledge what sort of difficulties at which we may be looking. On the off chance that the bot is going to speak with the client, it ought to have a type of knowledge. The most fundamental insight can be actualized automatically utilizing if or switch guidelines. Notwithstanding, for progressively complex situations it’s generally insufficient. Fortunately, Microsoft gives the LUIS. It is a ground-breaking cloud administration giving NLP highlights. This administration enables anybody to fabricate a custom NLP model mechanically. They do it just by furnishing a few expressions and coordinating them with the right expectations. In spite of that, MS Bot System accompanies out-of-the case support for LUIS administrations to give simple joining. It justifies memorizing that LUIS has a compelled portion for open use for each month, and it may be necessary to drive up to a satisfied utilization plan. For multi-language bots, there might be a need to enroll and keep up different LUIS administrations, which may expand the expenses. An outside administration should be grown cautiously, concentrating on great execution. It is to reserve the outcomes away accessible for the bot. It merits exploiting the highlights each channel offers to bots, mainly because it’s anything but awkward to create. In any case, you should know that the Bot Structure doesn’t ensure all parts will be accessible and will look and carry on a similar route on every single available channel. You can check and think about channels includes on Bot System Channel Examiner. Naturally, the bot framework is a platform where the skilled developer constructs bots. For building intelligent bots, the critical step is to select the language in which a human can easily interact with the bot such as English, Hindi, and French, etc. Microsoft has already included this powerful feature for the developers. LUIS is provided by Microsoft to understand the language against the user’s intent. LUIS allows bot developers to make an application in NLP (Natural Language). NLP can get used for taking input from the user. LUIS language understanding provides understanding ability about a user’s intent. We are among the most reliable chatbot development services; clients from all around the worlds can feel free to reach us for getting their customized chatbot precisely as per their actual business needs. No matter you are an individual, running a small business or a large enterprise, it is a perfect place to get your chatbot ready.